Meet Freddie Cottonmouth - A Boy Who Loves the River, Big Adventures, and a Furry Beast named Tug. Tug loves taking Freddie on wild adventures--trips to the moon, building castles, or catching fireflies with Freddie riding on his wide furry back. When Freddie finds a mysterious egg, Tug makes him promise never to eat it. But Freddie is about to discover that broken promises come at a great price. This is the rare children's story--both bold and tender and brimming with moments of great risk, adventure, and heart. Combining the artistic wonder of "Where the Wild Things Are" with the timeless storytelling of "The Polar Express," this story will capture both the imagination and the intelligence of children and their parents as it sheds light on the power of sin, sacrifice, and redemption. 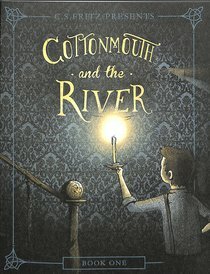 About "Cottonmouth and the River"